In general, living in a foreign country – for example, by studying there – is a great way to learn about the country, its language, people, and culture. There’s one country in particular we think it would be very valuable for some of our readers to become knowledgable about: China. It’s the world’s largest country by population, and gets closer every year to being the largest global economy too. On the international stage, China is the probably world’s second most influential country. Its influence in economic, geopolitical, and cultural terms looks set to continue to grow throughout the course of the 21st century. All of this means that China is likely to play a larger and larger role in all kinds of areas, including topics we care a great deal about, like factory farming, pandemic preparedness, preserving international peace and cooperation, and AI research. Being familiar with China is likely to provide unique and high-value opportunities to people working in those areas. What’s more, there aren’t yet many westerners with deep (or even passing) familiarity with China, which suggests that now is an especially valuable time to be learning more. 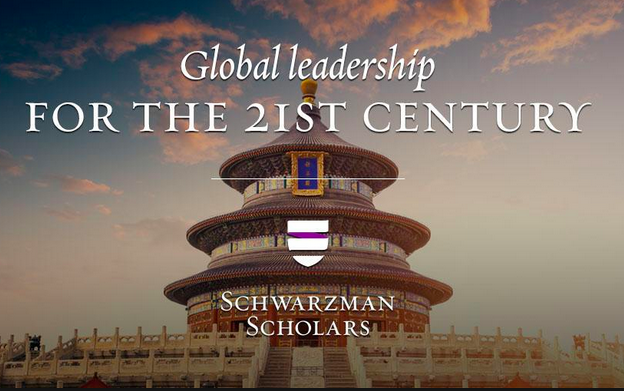 If you’d like to become knowledgable about China, there is a promising new way to do that: the Schwarzman Scholarship program. Modelled on the Rhodes Scholarship, the Schwarzman Scholarship is targeted at high achieving students from around the world with an interest in leadership, entrepreneurship, and international affairs. Each year, the program accepts up to 200 applicants, with 45% from the US, 20% from China, and 35% from the rest of the world. Scholars study at Tsinghua University in Beijing for 12 months and earn a Master’s degree in Global Affairs. The academic program includes some core courses (including economics, international relations, and Chinese culture, history and values), as well as the choice to specialize in one of Public Policy, Economics & Business, or International Studies. The program also includes mentorship, travel around China, on-campus social and academic events, and internship opportunities. It includes Chinese as well as non-Chinese students, so it will be easier to make local friends and contacts than in, for example, exchange programs where you are surrounded by foreigners. The program is focused explicitly on building connections between China and the world, and on emerging trends for the 21st century, both of which seem like important angles to explore. While it doesn’t seem to be particularly well-known or prestigious yet, the program’s advisory board includes Tony Blair, Nicolas Sarkozy, Condoleeza Rice, and Colin Powell; they also have endorsement videos from Michelle Obama, John Kerry, Henry Kissinger, Kofi Annan, and others. This seems like a promising sign both for how well-regarded the program is likely to be in the future, and for the quality of staff, lecturers, and so on that they will already have access to. As a 12-month program that is open to applicants with a Bachelor’s degree in any field, this seems like an opportunity that could suit people of many different backgrounds, at different stages of their careers. To be eligible, you need to have completed an undergraduate degree, be proficient in English, and be at least 18 but not yet 29 years old as of August 1, 2018. Applications are open until September 28, 2017 for non-Chinese applicants (for Chinese applicants, 2017 applications have already closed). …the program sets up the scholars with some excellent internships and has incredible one-on-one mentorship: some of the mentors include high level government officials and several CEOs of large companies. Note that the acceptance rate this year was around 3% and is harder for non Americans because of their mandated student body composition. So it’s quite competitive. The student body so far is very heavy on social science and East Asian studies specialists – there’s a dearth of humanities people/philosophers; that could be a good angle to frame an application around. I want to use philosophy to change lives, and the Schwarzman offers unmatched training and context. Nowhere are both the opportunities and challenges of policy and ethics more salient than in today’s China. There, policy operates at a scale unseen in history: small changes can have massive reverberations. Taking the large view, 80,000 Hours was indispensable to my receiving this scholarship. Their career advice set me on a path where I believe I can make a real difference in policy, a passion I’m hoping to explore during my year on this scholarship. To those hoping to make an impact early in their career, the program is an exceptional opportunity to engage with real decision makers. Are you interested in 80,000 Hours or effective altruism as well as China? If so, take a minute to let us know. We’ll email if we find a good opportunity for you there – for example in promoting effective altruism or working on our priority problems. We’re particularly keen to meet Chinese speakers, people living in China, or people familiar with Chinese culture.